I just adore these retro styled swimsuits from Abaete. Designed by Laura Poretzky. What's not to love? Super glam 40's & 50's classic styling with a modern twist. The lines accent the curves of the body and cover up just enough. I'd wear any of these in a heartbeat. The white one below is also offered in a blush pink. Sweeter than candy I say! Ahh the 60's. 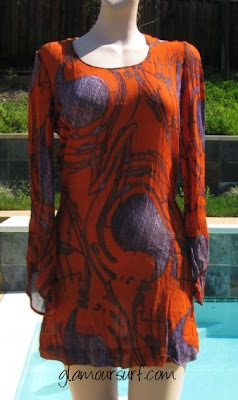 We recently acquired this lovely little frock made of semi-sheer silk voile by the fabulous Rudi Gernreich. Pieces such as this can be timeless, after all Rudi was a man before his time in his design sense, construction and trend setting fashion ideas. So we went on a search for images that would help us date it more precisely. After searching on the net for quite some time and coming up empty handed we popped over to the Vintage Fashion Guild. One of our colleagues at the VFG, Melody of Tangerine Boutique, who has just started her own blog, sent us a scan of this image from The Rudi Gernreich book by Peggy Moffit and William Claxton. 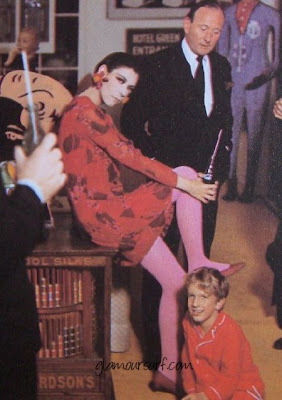 This image is of Peggy Moffit modeling a 1965 chiffon "Klimit" cocktail dress by Gernreich. The pattern is just a bit different but most likely there were versions of this dress in different fabrics to make up the collection. Then we found and purchased this lovely pattern on line. The pattern dates to 1967 from New York Designers Collection Plus, by Rudi Gernreich. The image mentions that the Rudi Gernreich Original was photographed in New York. But look, it's the same print as our dress that we have listed over at GlamourSavvy. Most likely the pattern came out a while after the debut of the collection this dress was part of. This pattern also has more bell shaped sleeves and an empire elasticized waist but it's marvelous all the same and we can see now that there definitely was a collection this dress was part of. So it just goes to show that there are various ways to help you date vintage clothing; pictures, books, colleagues, communities and even patterns. Both of these visual clues helped date the dress to 1965, and both are available at our on line store GlamourSavvy. This past Memorial Day weekend marks the beginning of summer. We spent the weekend doing some wine tasting at Calera Winery, who are know for their fabulous Pinot Noir varietals. Turns out they were also voted Winery of the year in 2008. Lush and yummy, we came home with a couple of bottles and had a wonderful back yard BBQ with the extended family. Meanwhile dear daughter spent the day frolicking at the beach in Santa Cruz where the annual Blues festival was played out with the likes of BB King and Joe Cocker. What did you do to mark the beginning of Summer? We're having a sale. From now to the end of May we're offering 25% off all purchases at GlamourSavvy and 15% off all purchases at Glamoursurf. Just enter code work 'Glamour' at checkout and your discount is automatically applied. Glamoursavvy stocks vintage clothing and accessories for men and women. 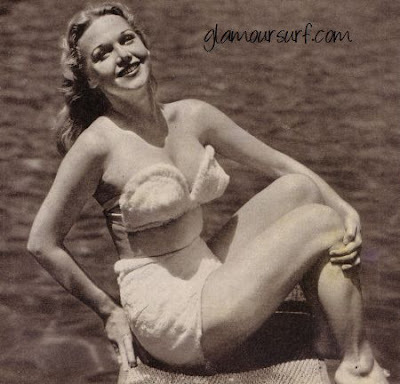 At Glamoursurf you'll find fabulous vintage swimwear, resort wear and lingerie. We've even stocked up on some fun beach accessories. And if you like to sew Glamoursurf and Glamoursavvy both carry vintage patterns from the 40's & 50's. 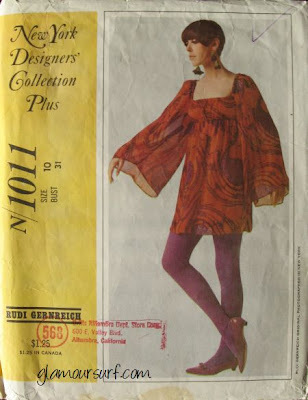 Also over at Glamourstitch we carry a large selection of patterns from the 60's, 70's and 80's. Now to the end of May buy 2 and get one pattern FREE! In the notes section of your order simply state 'Splash' and I will send you a revised invoice through PayPal. Lowest price pattern of the three you select will be free. Offer valid now to May 31, 2009 only. This fashion spread called Body Graphics is from Vogue China June 2009. This first image is my absolute favorite, the combination of stripes and polka dots and that cute little bubble peplum. Add to that a festive hat and a hyper short long sleeve top and voila. The model in these shots is Liu Wen. Isn't she stunning? The art of the turban, the combination of prints and angles is just so captivating. And the photography by Josh Olins is superbly amazing. Do you have a favorite? We finally got to watch Grey Gardens last night, the premier movie made by HBO films starring Drew Barrymore and Jessica Lange. What a fabulous film. If you are an aficionado of vintage fashion this is a must see movie. Drew plays the part of Little Edie and the film is masterful in the transformation of her from a young age to, well let's just say, an older age. I was particularly enamored with the beach scenes and Drew wearing a white satin swimsuit. We have some very similar suits in our store at Glamoursurf. The first is a pale blue swimsuit with trapunto work on the modesty panel. The second is a stunning stretch satin yellow swimsuit. This was a style popular in the 40's. 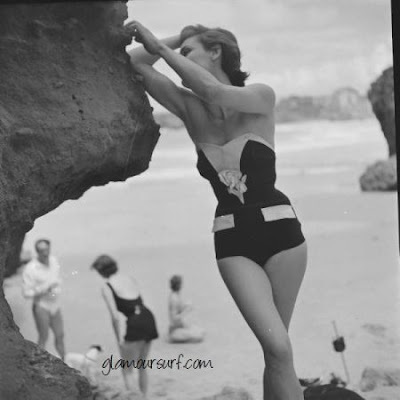 So if you like Drews look, you can recreate it yourself with a fabulous vintage swimsuit from Glamoursurf! We love hearing from our customers. 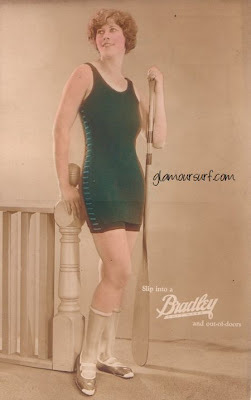 We recently blogged about a customer Secelia, who had purchased this swimsuit from our site on Glamoursurf for a bathing beauty contest at Galveston Beach. Secelia wrote to us today to let us know she won second runner up in the contest which was held this past weekend. Doesn't she look cute? Secelia is a high school senior at Ball High School in Galveston, TX. Twelve women competed in a modern bikini contest, while 28 women and two men competed in the vintage round. I'm so glad to see a fun pageant like this and it's lovely that there were actually more contestants in the vintage category than the modern one. You can see more images here. Congratulations Secelia, you look fabulous! A Slip Of A Girl with vintage tips for laundering vintage girdles. Couture Allure looks at vintage swimsuits from Tina Leser, Givenchy, and Polly Hornburg. Glamoursplash takes note of Claire's McCardellisms. Here's Looking Like You, Kid reviews Vintage Compacts & Beauty Accessories by Lynell Schwartz. Kitsch-Slapped reviews Cinderella Nurse, a novel from the 1960s. Things Your Grandmother Knew has FREE vintage slipper & scuff crochet patterns. 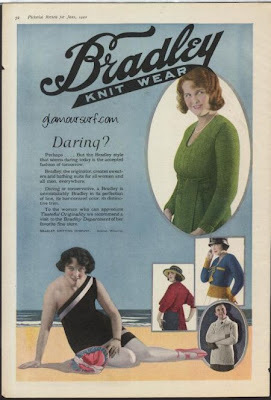 The Bradley Knitting Company was established in 1904 in Delavan, Wisconsin and produced sweaters, jerseys, bathing suits, scarfs, caps, children's suits, sport and golf socks, gloves and mitts. These are a few of their advertisements from the 1920's . This one shoulder swimsuit from the 1920's was pretty daring at that time. And here's another one with the one shoulder look. As an illustration it's fun complete with stocking and bathing shoes. And finally a color rendition of the same water slide. I'm not able to find much information on Bradley, but it was the major industrial mill in Delavan and employed many of the local residents for 30 years. My how times have changed. 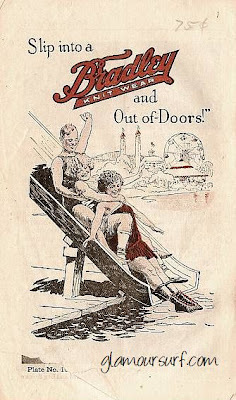 This is an image of a Bradley Swimwear Style book from 1924. The image of the gal on the right reminds me of the Jantzen diving girl and I'm wondering if they were intentionally trying to capture that essence. Jantzen's diving girl originally appeared in 1920. In 1922 Jantzen provided stickers for store windows that customers placed on automobile windows. A craze swept the nation and millions of the stickers were given away. It's interesting isn't it? Competition, branding, advertising and copycat tendencies have been around a long long time. 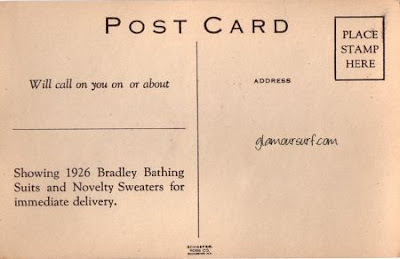 I love it when I find vintage postcards and these are no exception. Bradley salesmen used these to book appointments with prospective customers. These cards date the suits to 1926. Slip into a Bradley and out-of-doors. 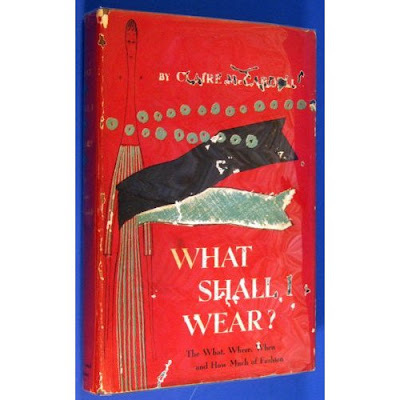 I finished reading the original 1956 versionof 'What shall I wear' by Claire McCardell a while back and was fascinated by terms that Claire refers to as McCardellisms - A glossary of Terms that speak to me of Fashion and haven't very much to do with Webster. NIGHTGOWN SILHOUETTE: Beloved high waistline, comfortable, easy. Demands small rib line, makes all legs look longer. An uncorseted look, a revolution against discomfort in clothes, recurring often as a protest when you can't breathe or move in tight lacings; and it covers a bad hip line with ease. KITCHEN-DINNER DRESS: For the cook who is the hostess. She cooks in the kitchen; you eat the dinner there - but it's best cooking you have ever had, and probably the best dressed cook. PANTS: Short, long, tight, full: shorts, ski pants, riding pants, jodhpurs, blue jeans. T-SQUARE: Cut with sleeves like a T-Square, often a beach cover. ROUGH-DRY: Cotton fabric that dries with a crinkle, no ironing. HOOKS and EYES: Fastening for belts or fronts of dresses. SNAPPERS: Jackets, blouses, pants snap on and off. POCKET: A necessity in every dress, usually useful, but sometimes a line to mark a hip bone - also a place to put your hands. STORM COAT: Rain, snow, sleet - warm inside, waterproof outside; strapped together, covers everything - suits in town, ski clothes in winter. SWATCH: The clipping of fabric I carry around to inspire me to make a new dress for you. COAT: Anything that goes over everything else. You can be "coated" in a stole. POPOVER: Something that goes over anything. It is an apron one day, a bathrobe the next, a dinner dress, if necessary, with lots of beads. MONASTIC: Gunny sack, stringbean, any dress without a waistline, to be belted or sashed as you like it. DRESS-SHIRT: A dinner shirtwaist dress, easy, comfortable, sit on the floor type, rugged fabric that wears. STRIP - TEASE or MATCHES: Clothes in pieces. You can wear all of them at one time or only two or three pieces- but they go together and are made of related fabrics. FIGURE: it means , of course, the size you are. It is taken for granted that none of you are overweight; it is accepted as fact that none of you are perfectly proportioned. Not all average figure faults are found, however, in a single female. The ideal is seldom seen outside of the fashion drawings: legs inhumanly long, waist incredibly small, enough and not too much of everything else. But you can learn from this ideal. Highlight the spots that coincide - a really small waist for instance. Soft pedal the places that are out of line - no slim, straight skirts for wide hips is a case in point. When I say "Small" in this book I am thinking of 5 feet; medium is the range between 5 feet 3 inches and 5 feet 5 inches; Tall is model height, over 5 feet 5 inches. Small Waist: at least 12 inches smaller than bust and hip measure. MODEL: A girl you can't compete with unless Nature gave you a head start and you are willing to starve, exercise, go to bed early, learn a special walk. But you can learn self-discipline from her. HEMLINES and WAISTLINES: Very definitely Datelines. GLITTER: Usually to be avoided; never to be added to "shiny." TYPE: What people tell you you are to flatter you; not always a compliment. HAT: Anything on your head; it could even be a straw bracelet encircling your topknot. McCARDELL HEEL: Illusion: elegance. No illusion: it's low-slung comfort. SASH: Anything that ties around your waist, as opposed to belts, which have set fastenings. FASHION: An indefinable something that every woman would like to know. COLOR: Always different in different fabrics; sometimes dangerously so. TREND: Don't start one if you can't be teased. MANGY, MOTH-EATEN (as applied to fur): Not literally, impressionistic, unglazed, moleish. OLD GOLD: A color. rather dirtyish; can be applied to brass just as well as tho the 14 -carat variety. It's a wonderful book that is being re-released and can be pre-ordered on Amazon now. The Bobbypin Blog tells us how makeup effected minorities in early cinema. Things Your Grandmother Knew shares vintage tips on how to care for your books. Kitsch-Slapped defends internet sellers and historians from an attack in Antique Week. Holly Gab brings an aura of intrigue and mystery to this vintage '70s country club dress. Here's Looking Like You, Kid shows us pages from a vintage lingerie catalog. Glamoursplash provides a roundup of vintage swimwear resources. Fur at the Beach, yes Fur! I love this shot, I'm just not sure why. It's one of those images that just captivates me. Fur on the beach, how gauche! 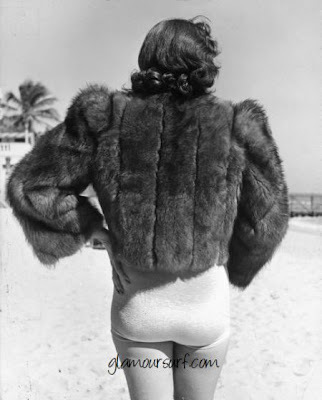 And we're not talking baby seals here, this is an actual coat worn over a swimsuit. It's mysterious and I can only see her back so I'm not exactly sure of the purpose of the coat or even if there is a purpose beyond perhaps being cold. But why fur at the beach? In the early days swimwear was made of wool, even that is a little hard for me to get my mind around. But wool and fur? This photo is from 1916 and features Alice Maison in fur fox tails at the beach. Alice was an early pin-up girl, before they were called pin-up girls. Swimsuits were not revealing enough to be worn by pin-up girls. So it was fur at the beach for cheesecake shots for publicity purposes. Here's another shot of Alice Maison from 1918. Again, with a fur muff and hat. I adore the style of that suit she has on too. This is a shot of Marian Carr in 1948. She's wearing a rabbit fur two piece swimsuit. I just can't imagine that that would hold up very well. Movie publicity men we're trying to come up with new angles for promotion and since pretty girls are plenty, fur swimwear was a viable option. Beauty at the beach I understand but fur at the beach? It doesn't work for me, it's just too odd of a juxtaposition. Have you heard about the new kid on the block? We're talking Market Publique. Market Publique launched in March of this year and has been gaining momentum ever since. Love to shop for vintage fashion? Tired of EBAY? 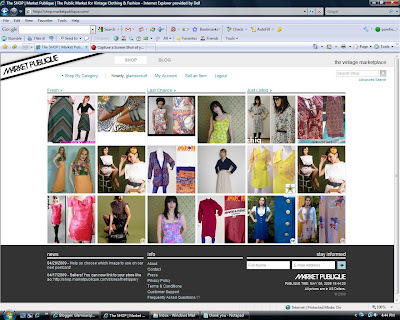 Tired of searching for vintage clothing on individual vintage sites? Go over to Market Publique where all the vendors offer VINTAGE FASHION!! It's a virtual vintage shopping mall with a fabulous selection of vintage clothing and accessories. They hope to add vintage men's wear into the mix soon. And they even have a blog. Stop on by and tell Pamela (the owner) hi while you're there, she's a sweetie! Yes, we joined and are selling a few things which I'm sure will grow in the coming months. You can find Glamoursurf here. 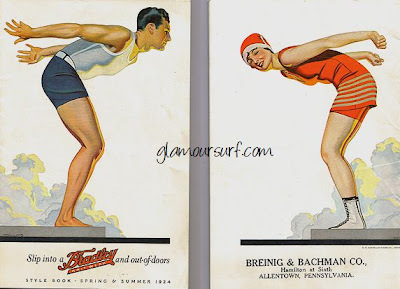 I thought it would be fun to create a bathing suit resource roundup, a list of some of our on line colleagues and friends who have some wonderful swimwear sections chock full of information on vintage swimwear or just some beautiful eye candy. First off is Fuzzy Lizzie; Lizzie has put together a very interesting tour of vintage swimwear from her personal collection. She is also a vintage sportswear aficionado and has a wealth of information and topical articles here. Next is Angie from Capricorn Vintage. Angie has just recently launched her website and has included a virtual swimsuit museum from some of her past sales. Yummy, yummy! The Vintage Fashion Guild gives us a nice article on the history of the swimsuit called 'In the Swim'. The VFG also has a comprehensive label directory which includes swimsuit brands. Bikini Science presents us with a history of the bikini via a virtual time machine. Galbreath has plenty of pretty pin up pictures of stars in swimwear. Love this site! Roselyn Hsueh gives us the history of the bathing suit. 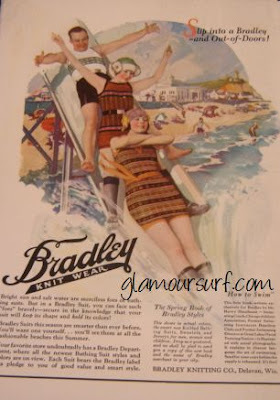 On to men's swimwear, David Claudon has put together a fabulous resource on the history of men's swimwear which can be found here. And yup, then there's Glamoursurf. 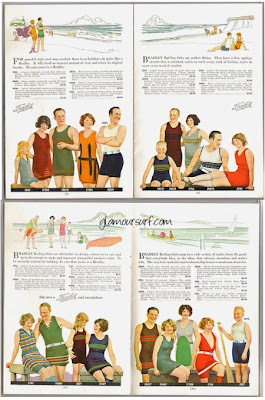 We have a label directory, a swimwear timeline, many articles on vintage swimwear, and a marvelous selection of vintage swimsuits for men, women and children you to choose from. And of course you can always search our blog here at Glamoursplash as we post daily with vintage swimwear information. Enjoy! Last week a customer purchased this swimsuit from Glamoursurf for the upcoming Galveston Island Beach Review 2009 Bathing Beauties Contest. The contest will be held on May 16,2009 at 2:00pm. Dubbed the "Pageant of Pulchritude" by C.E. Barfield, the Galveston beauty contest began in the summer of 1920 and from then on marked the kick-off for tourist season each year. By 1928 the event had morphed into the "bathing girl revue" and became so popular, the Island’s population nearly tripled during the event weekend. This year the contest is being resurrected with two categories: Contemporary & Vintage Inspired. Cash prizes are being awarded to the winners and runners up. Contest is limited to the first 30 contestants in each category. You must be 18 to be eligible to win. Sounds like fun doesn't it? Mermaids - Mythological or Not? Love this photograph. 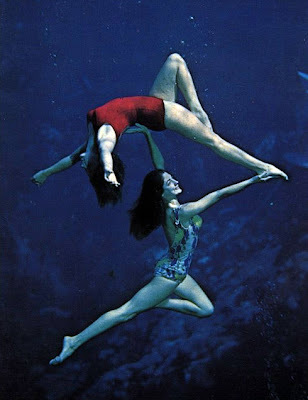 Toni Frissell is one of our favorite photographers. More of her work can be seen here. This underwater model certainly looks like what I would visualize as a mermaid. 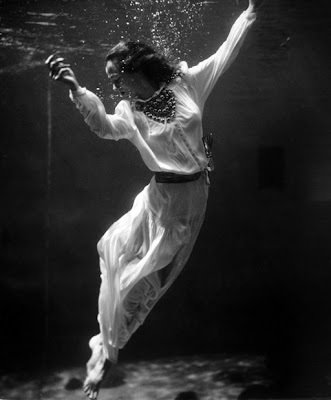 A fashion model underwater in the dolphin tank at Marineland, Florida circa 1939, Toni Frissell. Mermaids were a big hit at the tourist attraction Weeki Wachee Springs in Florida. The attraction began back in 1947 and still continues to this day. You can read about the history of Weeki Wachee here. 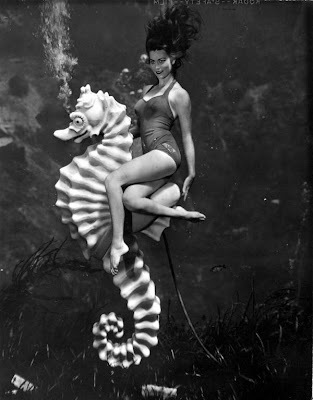 Mermaid Bonita Colson at Weeki Wachee Springs : Weeki Wachee, Florida circa 1960. More mermaids at Weeki Wachee. So what say you, are mermaids simply a mythological aquatic creature? We think not.